Good experience. Close to shopping, entertainment and transportation. Hotel was beautiful and everything was great! Starbucks in the hotel was super convenient and the rooms were great. Definitely would stay again! Staff was excellent. Very impressed with the attentiveness. Very expensive, thought my bill was a certain amount then was charged more money, and I booked with Orbitz. Room and bathroom was very clean and bed was very comfy. Desk staff were fine...not outstanding. My room was located on a quiet area which is good. No loud hotel neighbors. Hotel is centrally located. Easy to get to public transportation, bridges, highways...Lots of shopping nearby. We discovered a club on the roof! Very fun, good music, food & drinks. Hotel room was very comfortable and quiet. We enjoyed it! The rooms were boxy small for the price. The water Tempuwas boiling hot and the col water streamed so it was difficult taking a shower and washing your hands. The room wasn’t cleaned everyday and I requested it more than three times. It was great. I loved it there. The staff were very professional, friendly and helpful. Perfect in every way. Totally satisfied. Will book again. It was a fine hotel. Worth the money but also had relatively inexpensive parking a block away especially for NYC prices. The room was big and the view was great. Right in downtown Brooklyn and easy to get around. Ill try to stay here again next trip to the city. I needed to come to New York for one night. My main concern had been checking out since I was certain my reason for being in New York would conflict with the 12 noon check out time. the staff simply pushed my check out time forward and everything worked out. Excellent facilities. I ate dinner at the restaurant and the food was great. Also the fitness center is great for something quick. Not to mention if you enjoy running, prospect park is very near. The room was clean, attractive and quiet. A good choice for the Times Square area. Located in Downtown Brooklyn, Sheraton Brooklyn New York Hotel is within a mile (2 km) of popular sights such as Barclays Center Brooklyn and Brooklyn Bridge Park. This 321-room, 4-star hotel has a restaurant along with conveniences like an indoor pool and a health club. This hotel is home to a restaurant and a bar/lounge. Savor a meal from the comfort of your room with room service, or get a quick energy boost at the coffee shop/café. Start your day off with breakfast, available for a fee. A 42-inch LCD TV comes with cable channels and first-run movies, and guests can stay connected with WiFi and wired Internet. Pillowtop beds sport down comforters and the bathroom offers a hair dryer and designer toiletries. Other standard amenities include an iPod dock, a coffee maker, and free newspapers. 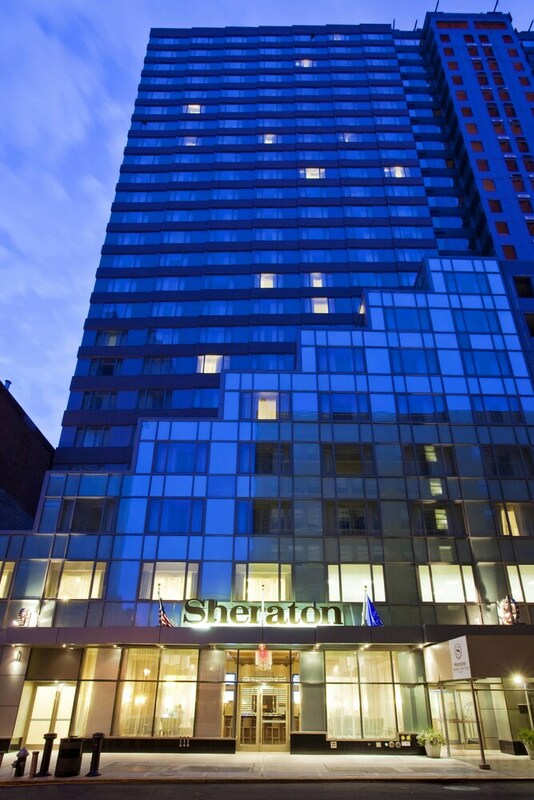 Guests of Sheraton Brooklyn New York Hotel have access to an indoor pool, a health club, and a spa tub. Parking is available for USD 35 per night (USD 45 per night for valet parking), and there's also limo/town car service. Multilingual staff at the 24-hour front desk can assist with tours or tickets, dry cleaning/laundry, and luggage storage. Additional amenities include WiFi in public areas, a 24-hour business center, and a computer station. Grubstake Restaurant - Restaurant and bar serving breakfast, lunch, and dinner.